RBTH presents a selection of views from leading Russian media, featuring analysis of the failure of the truce agreed in eastern Ukraine, the prospects for Ukrainian President Petro Poroshenko’s peace project, and Putin’s surprising request to Russia’s Federation Council to retract the permission it granted in March to deploy Russian troops in Ukraine. Kommersant reports that the ceasefire in Donetsk was broken by a shootout, and both sides in Ukraine have accused each other of violating the agreements. The Armistice Agreement between the Ukrainian security forces and federalization supporters that was reached on Monday evening in Donetsk was broken only after a few hours. Kommersant reminds its readers that representatives of the self-proclaimed Donetsk and Lugansk people's republics were participating in the negotiations for the first time, and the meeting resulted in ceasefire agreements, which, according to mutual agreement, both Kiev and federalization supporters were required to put into action before June 27. 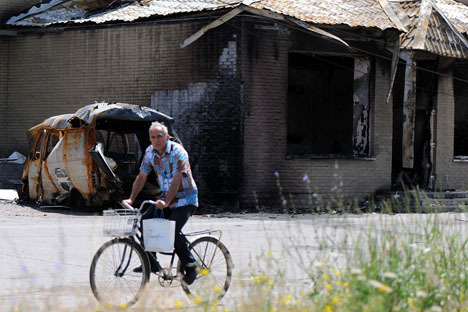 Press Digest: Will the ceasefire in Ukraine hold? According to the newspaper, representatives of Lugansk’s “self-defense forces” have accused the Ukrainian army of shelling the suburbs of Lugansk. The leadership of the “anti-terrorist operation” also announced that militia opened fire on a checkpoint at the junction of roads leading to Krasnyi Liman and Slavyansk several times during the night. Kommersant notes that the situation in the region remains tense, but “at the same time there is hope that a peaceful settlement is still possible.” The publication argues that recent events also demonstrate that not all militia commanders serving in these breakaway republics responded to the order. “The fact that they opened fire confirms that not all field commanders are obeying the official leadership of the Lugansk and Donetsk People's Republics,” Kommersant reports. Novaya Gazeta, in an article titled “Pust govoryat?” (“Let them talk?”) notes that “any attempt to return to peace in eastern Ukraine, of course, is preferable to military action, but the country may pay in the long term for such a resolution.” Regarding the negotiations in Donetsk, which took place after Ukrainian President Petro Poroshenko announced his peace plan, the publication notes that there is still a lot of conflicting information. Kiev has delegated Leonid Kuchma for the mission. In 2003, then- president Kuchma was able to find common ground with Vladimir Putin and thus earned the status of a peacemaker. Moreover, according to the newspaper, Kuchma is remembered as the “the figure most willing to compromise with the Kremlin.” However, a decree confirming the authority of the ex-president in the negotiations so far not been made public for some reason, according to the publication. On the contrary, Irina Gerashchenko, who was appointed by President Poroshenko to oversee the peaceful settlement of the situation in eastern Ukraine, is not involved in these negotiations, reported Novaya Gazeta. “The current situation is a thousand times more dramatic than before. The Russian side, apparently does not see itself as a negotiator, but instead has actively formed part of the “team” of separatists,” writes the newspaper. Official Ukrainian statements have only asked all those who break the law and are guilty of shedding the blood of citizens to simply “Hand over [their] weapons!” Poroshenko is pretending that everything is going according to plan, the newspaper says. Novaya Gazeta informs its readers that some politicians have claimed that Poroshenko is taking a big risk: The country’s public does not accept the “Eastern project” under the leadership of Viktor Medvedchuk because it “casts doubt on Ukraine’s European prospects.” “However, perhaps a compromise could be offered, although it would be a setback for Maidan, which would ensure that special elections to the parliament will see representatives of the “elite” separatists gaining seats,” suggests Novaya. Several Russian political scientists and analysts have noted, according to the newspaper, that the decision can be linked to Russia’s hopes for the success of the peace process. "Otherwise, Russia would hardly decline such a potential trump card as the possible use of its armed forces. By eliminating the threat of force, this means that the negotiation process is underway,” reports Expert.